The cyclic polypeptide hormone Somatostatin was originally isolated from the hypothalamus and characterized by its ability to inhibit release of growth hormone from the pituitary gland. It exists in two forms, somatostatin-14, composed of 14 amino acids and somatostatin-28, a prohormone composed of 28 residues. ab8903 has not yet been referenced specifically in any publications. Publishing research using ab8903? Please let us know so that we can cite the reference in this datasheet. 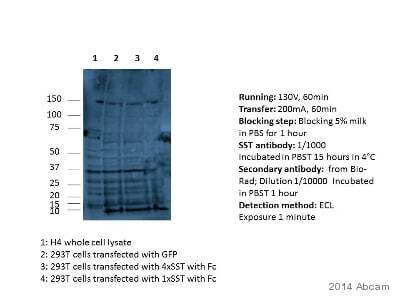 What is the expected kDa of Somatostatin-14? Thank you for your enquiry. ab8903 was raised against rat Somatostatin 14. 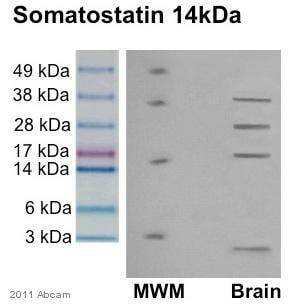 The predicted molecular weight of rat Somatostatin 14 is 12.7KDa. I hope this information helps, please do not hesitate to contact me should you require further assistance.